MyNetDiary is built on a solid, scientific foundation, following guidelines, recommendations, and equations of the Academy of Nutrition and Dietetics, American Diabetes Association, the American Heart Association, and United States Department of Agriculture (USDA). We strongly believe in evidence-based science. The nutrition science works. On the surface, MyNetDiary does the same tasks as other calorie counting websites and mobile apps, but what makes MyNetDiary different is its comprehensiveness combined with casual simplicity and ease of use, enabled by state-of-the-art technology and years of research powering MyNetDiary under the hood. MyNetDiary is so easy, helpful, and such a pleasure to use that people keep using it, for months and years to lose and maintain weight. MyNetDiary is loved by its users! On the iPhone and iPad, MyNetDiary has a stellar 5-star rating. Other MyNetDiary's apps have strong 4.5 star rating. The combination of nutritional science, ease of use, and comprehensiveness is the winning magic of MyNetDiary. We found out that over the years, as more doctors, dietitians, and trainers discover MyNetDiary, MyNetDiary becomes the most frequently recommended food diary and calorie counter by doctors and dietitians, the golden standard of nutrition and exercise tracking and diet management. Download detailed and comprehensive MyNetDiary HealthCare Professional Guide in PDF format. Here are some of the many reviews left by our users. I taught nutrition at the college level for 30 years. I worked for Nutrisystem as a counselor and have been a private weight loss and eating disorder counselor for 25 yrs. I love love love this app. I have downloaded several apps, but this is the only one I use. I used to spend hours going over clients logs, now this app does all the work for me. I make all clients download it on our first meeting. I cannot imagine a better app. My clients also adore it! Tool for the doctor's bag! I am sure I have chased away several weight-concerned patients with my "simple" equation. Lately, patients are asking me... "Doc, how did YOU lose weight?" Most of my patients have smartphones... and my conversation with them now includes a demonstration of my MyNetDiary app. Extensive food and exercise database. Love the graph and goal setting features. Since adding ability to access database when not connected to Internet, near perfect app. I am a nurse practitioner and recommend MyNetDiary to my patients for diabetes regulation, weight loss, and nutritional awareness. As mentioned above, MyNetDiary follows the guidelines, recommendations, and equations of the Academy of Nutrition and Dietetics, Institute of Medicine, American Diabetes Association, the American Heart Association, and the United States Department of Agriculture (USDA). Basal Metabolic Rate is calculated following predictive equation suggested by Mifflin, MD; St Jeor, ST; Hill, LA; Scott, BJ; Daugherty, SA; Koh, YO. It has been demonstrated to be 5% more accurate than Harris-Benedict Equation. Weight maintenance calories are calculated per Estimated Energy Requirements formulas provided by the Food and Nutrition Board of the Institute of Medicine of the National Academies. Calculates target daily calories for up to 2 lbs/week weight loss rate. If you recommend your patient or client a different daily calorie target, it is possible to enter target daily calories manually. Allows to customize target carb/fats/proteins ratio. Uses The Compendium of Physical Activities Tracking Guide, prepared by Ainsworth BE, Haskell WL, Herrmann SD, Meckes N, Bassett Jr DR, Tudor-Locke C, Greer JL, Vezina J, Whitt-Glover MC, Leon AS. Healthy Lifestyles Research Center, College of Nursing & Health Innovation, Arizona State University. Retrieved April 5, 2012 from the World Wide Web. For each food, MyNetDiary calculates Food Score. The methodology was published in the June 2009 issue of the Journal of the Academy of Nutrition and Dietetics, in the article Modeling Expert Opinions on Food Healthfulness: A Nutrition Metric by Jolie M. Martin, MBA, PhD; John Beshears, AM; Katherine L. Milkman; Max H. Bazerman, PhD; Lisa A. Sutherland, PhD, and used by MyNetDiary with permission. The study distills expert knowledge of leading U.S. nutrition experts into a simple nutrition metric, to help compare foods and make more healthful food choices. MyNetDiary was invited by Indiana Dietetic Association to share experiences and best practices leveraging smartphones in RD work at its annual conference. MyNetDiary's advisor, Katherine Isacks, MPS, RD, CDE gave the presentation in April 2012. You can view the slides here. While tracking a diet, most time is spent entering foods and this where MyNetDiary shines. 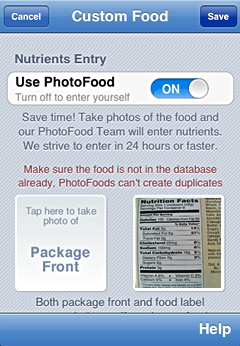 Besides instant search as you type, intelligent favorites and barcodes scanning on iPhone and Android, MyNetDiary provides the best food database in the world, saving time entering food nutrition facts. There are over 716,000 verified foods in the database. Our PhotoFood Service available on the iPhone Pro app helps us grow and update the database steadily and ensure its high-quality. We add or update several hundred foods every day, including weekends. One of the older, more well-known database provided by CalorieKing has only about 50,000 US foods and about 19,000 Australian foods according to Wikipedia. The Daily Analysis box on the website and Daily Analysis screen in mobile apps show your daily energy balance, estimating how much weight you are losing (or gaining) on each day. For each day, it compares your key nutrient totals with recommendations by Academy of Nutrition and Dietetics, helping you eat more healthfully. MyNetDiary Pro for iPhone also provides Weekly Analysis, calculating expected and actual weight loss and suggesting possible explanations for differences (if any). It also calculates weekly averages for nutrients required on Nutrition Facts labels and suggest good food sources in case of deficiencies. The analysis and tips are based on entered information and USDA and IoM guidelines and DRIs. For fast food entry, MyNetDiary apps for iPhone and Android provide a barcode scanner. 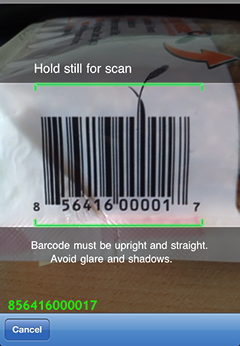 When you enter your daily foods, tap the scanner button to activate it and scan the barcode. Barcode scanner in MyNetDiary Pro for iPhone works on any iPhone! MyNetDiary Pro for Android scans on most Android phones with autofocus (requires free Barcode Scanner app download). We've been asked by thousands of our users to extend MyNetDiary to help people track blood glucose and insulin. We've been working for years on this, developing both the website and mobile apps to help you - to provide you an equally stellar, comprehensive and easy diabetes tracking. MyNetDiary Diabetes Tracking is available on the website and in the free iPhone app for MyNetDiary Maximum members, as well as in a special, comprehensive iPhone app that could be used standalone for diabetes tracking and does not require Maximum subscription. MyNetDiary allow tracking blood glucose, insulin, medications, blood pressure and more, specifying multiple target ranges and threshold values for blood glucose, assigning multiple labels to readings and entries, counting total carbs, net carbs, and diabetes carbs count. 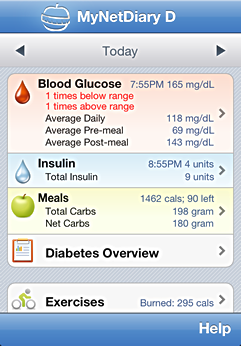 Learn more about website diabetes features, Diabetes Tracker for iPhone and Diabetes Tracker for Android. Through the website Community, it is possible to enable safe diary information sharing - with doctors and trainers, or with family members or friends. The following information could be selectively enabled for sharing: personal textual profile, “before” and “after” photos, blog, daily analysis, weight plan, weight chart, all other charts and reports. Sharing is controlled by the user via the community profile. As you can see, MyNetDiary is built on the same underlying nutritional science as USDA Super Tracker. The Super Tracker is a good and sound approach to improving one's diet - tracking foods and exercise, and helping make better food choices. MyNetDiary does exactly that, too! Better food database - 716,000 foods (979,000 with contributed) vs. 8,000 in Super Tracker. Simple, fast, easy - MyNetDiary website is like a smart spreadsheet that understands foods and can search as you type. Tracking body measurements, sleep time, and more. Mobile applications for on the go access for iPhone, iPad, Android, and Blackberry, synchronizing with web account. Built-in barcode for faster entry in iPhone and Android apps (where supported by hardware). We love free calorie counters! They introduce the concepts of calorie tracking to a wide audience, making them aware of modern ways of losing weight and managing diet. Being advertising supported, free calorie counters heavily depend on having the largest number of users and go for volume. MyNetDiary goes for quality and depth. 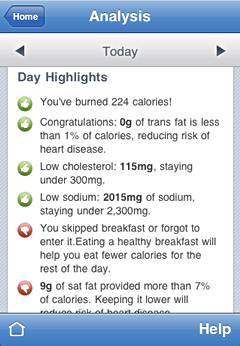 Eventually, more people try free calorie counter, more people graduate to MyNetDiary! Better, more reliable food database. Some free calorie counters advertise having over a million of foods in their databases. The caveat is that they typically rely on user entries, which often are not accurate or not complete. There is not a million foods in the world, these databases simply have many duplicates and out-of-date foods. MyNetDiary provides a high-quality 716,000 foods database, entered and maintained by us. More nutrients - free calorie counters typically have a limited number of nutrients - up to 8 or 10. MyNetDiary supports over 45 nutrients. MyNetDiary is easier to use - it searches as you type, remembers your previous foods, and so on. This is the key to long-term use and success. Daily and weekly analysis, encouraging healthful behaviors. In the end, you get what paid for. MyNetDiary is not just a biggest checklist of features! There are many websites and apps that seem to have many features, but in fact they are often clumsy, and difficult to use and stick to long-term. MyNetDiary is loved by its users! On the iPhone, MyNetDiary PRO has a stellar 5-star rating. I wish that I had this 20 years ago. Would have made life so much easier. Have lost 39lbs since the first of November with minimum effort. I love this app! The longer I use the happier I am with it. I have a few friends using it now. For the first time in my life I feel in control of food instead of the other way around. This app gives me all the information and knowledge that I need to be successful. I intend to use it the rest of my life. I love it! Better Than Any Diet - This Works! At 62 yrs, I have tried many diets to lose my 40 extra lbs. Nothing worked long range until I found this program. With MyNetDiary I finally made a lifestyle change to healthier foods & smaller portions. I can see the effects of my choices on calories & nutrition. I'm eating less & eating healthier. My expectations of weight loss are more realistic & I have been achieving them. The features incorporated into this program are amazing & keep me motivated to maintain this lifestyle change. I use this program to log all that I eat, my exercise, sleep, & daily weight. I am on track to lose 40 lbs in 30 weeks. This program has literally changed my life. I love this app and use it all the time. The calorie counter and food diary are very easy to use. I like that it gives variety of ways to document serving sizes and that very accurate measurements are allowed. I love that I can display my weight loss data in a variety of ways. I can see trends by various time periods such as by month or six months or a year, which helps me to see that my overall trend is weight loss and that a lot of apparent setbacks are just temporary blips. This has helped me to focus on general, permanent lifestyle change and slow weight loss instead of always striving for rapid weight loss. I am losing weight very gradually... just two lbs a month, and have been for a year. Being able to the chart whenever I feel impatient helps me to see the value of gradual lifestyle change and gives me the faith that I will reach my goal. Slow and stead wins the race! It's easy to use all day long. It only takes a few seconds to post each meal. Everything they say about this app is true. We believe that all this demonstrates and explains why MyNetDiary became the most recommended food diary and calorie counter - the ideal food and exercise diary for your patients and clients that is science-based and most importantly - would be loved by them. You can request your Free MyNetDiary Professional Pack by sending an email to info@mynetdiary.com. One free Maximum membership for you. You will get a 6-month gift card to create your free Maximum account. The account can be extended by sending a request to MyNetDiary Support. Two free 1-month Maximum gift cards for new users, so that you can try MyNetDiary working with your clients or patients. 50% discount for additional MyNetDiary Maximum memberships. You can pre-pay for discounted gift cards and provide them to your clients or patients for free. Alternatively, if you expect your clients or patients to pay, you can ask us about 50% off promotional gift cards, reducing subscription costs for them. 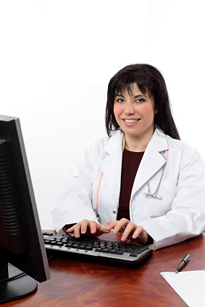 You can also get included into MyNetDiary's directory of health professionals. In this verification is not applicable or does not work for you, please explain how your professional credentials can be verified online or simply fax your credentials to fax number 1-(800)385-7461.